The newest Alzheimer's Care facility in Dublin, Ohio is Glenwood Alzheimer's Special Care Center. We offer multiple floor plans to accommodate a variety of our resident's needs. Our community offers a full-time, on-site nursing staff and group of dedicated caregivers to assist in the healing process and bring support and comfort to each of our residents. The staff at Glenwood is the only Alzheimer's community in Dublin that is trained in our exclusive Meaningful Moments® program. Through this program, our caring staff weaves the life stories of all of our residents into the fabric of their days here. The result is a comforting feeling of familiarity and meaning for those seniors with dementia needs in our community. Glenwood is a proud member of the JEA Senior Living community. JEA is a privately owned and operated management company whose expertise spans over 30 years in facilities stretching across the United Sates. JEA is known for assembling the very best in the industry to deliver quality services to our residents. 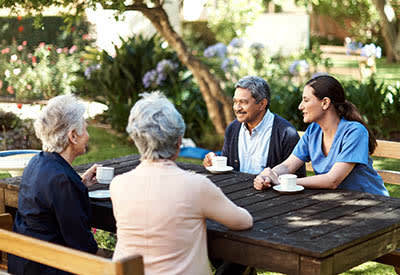 At Glenwood Alzheimer's Special Care Center we strive to "honor the experience of aging", by creating a true partner in care approach with each of our residents, their families, and medical providers. Click one of the links below for additional information about the services offered.